This unassuming little game, tucked away deep within the App Store, is actually a pretty good game, and can be classed as a ‘hidden gem’ of the iPhone. 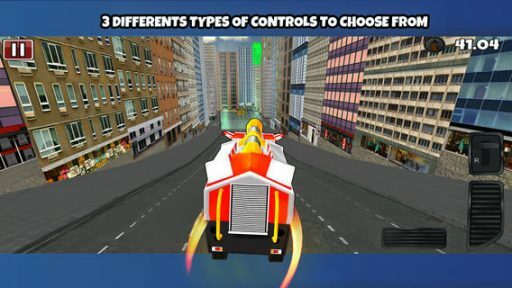 The game puts you in control of a massive red fire truck, and sets you the task of driving this beast across a city to a fire, and then to put the fire out with your hose. The game is presented in the classic third person driving viewpoint, and the graphics are actually fairly decent. The fire trucks are all colourful, and everything is bright and nice looking, particularly on a retina screen. A nice touch is that the trucks are deformable, and take damage whenever you hit anything, although in truth, you will be more worried about tainting your score than you will be at scratching the paintwork, as you must not only complete each level within a time limit, but also with the right score, in order to proceed to the next stage. It is more of an arcade game than anything else, as you must drive your way through 40 levels, each of which presents a different challenge. On many, you will be fighting fires, but there are also complicated time trials where you must drive through a tough course of cones with time penalties for each one hit. •Achievements – Go for perfection on every level to become a City Legend and complete the other many achievements of the game. I found the game pretty addictive, and fun, although I recommend changing from the default control method to either tilt or left/right, as this makes the game far more playable. The developer has done nearly everything right in terms of features, as there is Facebook integration, Game Center leaderboards, you can customise and upgrade the vehicles, there are plenty of trucks to unlock, and there are even achievements to discover. The only real thing missing is a ‘free’ mode, where you could explore a city and take emergency calls on the fly, but I guess the budget wasn’t there for this. Hopefully, this game will perform well and we will see that in a future release or update. The only complaint I have is with the ads, which are too obtrusive. The game is free, and has plenty of (well judged) IAPs, but the ads that pop up between each level are quite annoying as it is too easy to click them accidentally, and on one occasion, the ad wouldn’t let me dismiss it, and overlaid the game, forcing me to exit the game. Aside from this issue, which I am sure the developer will take a look at, the game is really quite addictive, and tearing around the cities in one of the unlockable trucks is good fun, so this game come with a warm recommendation. I’ve played a lot of games on my iPhone, but not too many games can engage me as well as Fire Truck 3D does.